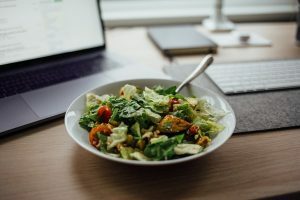 When I first heard of mindful eating I knew for myself: This is the answer to my searching on a healthier, more compassionate and nonviolent approach for people suffering from eating disorders. Why does not everybody uses it? What do we need to consider when doing ME research? Though there are several studies, research on mindful eating (ME) is still at its infancy. Especially in Germany, there was practically no research in the field and so far, the concept is pretty unknown in society and clinical practice. Thus, my personal aim in my PhD on mindful eating is bringing the concept via research in the minds of a broader audience and make it in this way accessible for people suffering. I started my first project in 2015 with designing a comprehensive questionnaire to be able to investigate the complex construct of mindful eating in a differentiated way. In the first two studies more than 1500 people participate. I felt overwhelmed by this huge interest in the topic and reassured in my own feelings for the mindful eating approach: It was worth the work to show an unknowing audience a door which reveals a whole new universe in experiencing their own eating behavior. Next to testing the questionnaire to see if it is valid, we discovered a lack of a linear relationship between mindful eating and Body Mass Index (BMI): People of average weight and people with overweight did not differ in their amount of mindful eating skills. Only people who were obese showed significantly lower mindful eating skills compared to both other groups. For me these results from this large study indicate that mindful eating is clearly associated with healthier weight (which I add overweight, too, as its just a human made definition of BMI categories). Now we know with proof, not only assume (what I am sure many of us did before): Especially people with obesity may benefit from ME-CL as they lack mindful eating skills. This is important because with obesity associated health problems such as diabetes and high blood pressure, and the psychological comorbidities of depression, anxiety and eating disorders, result in great suffering. Now with the results of this research we can begin to communicate the value of eating mindfully with potential clients, founders and authorities. Enthusiasm among participants in the first two studies showed huge excitement with the opportunities and possibilities the mindful eating approach reveals. We received a lot of feedback that just answering the questionnaire changed something in the minds of people and helped them to be more aware. 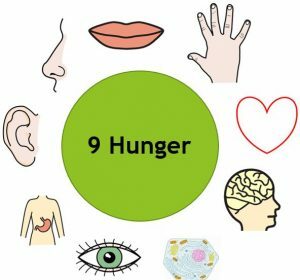 Regarding this feedback, for my second project I decided to focus on a single, but core ME-CL skill set, the 9 Kinds of Hungers, which is a clearly outlined exercise focusing mainly on increasing awareness and understanding personal reasons for eating. Such a study design would allow us to research the singular effect of these special components of mindful eating and would help us to clarify mechanism of action. Consequently, we designed an online training exclusively for practicing the 9 hungers. After watching a 50-minute introduction video, our 250 participants were asked to rate their 9 hungers for two weeks, every day once before and after a meal of their choice. Before, during, and three months after the training phase, we used questionnaires that mainly focused on measuring changes in eating behavior. So far, these results are promising, especially regarding effects on emotional eating. Along with questionnaires we used an open answer format to learn more about the individual experience with the 9 Hunger exercise, the kind of potential change(s) and mechanism of action. In addition to direct behavioral changes, with the help of this open answer format, I decided to rather focus on the internal or implicit changes in mind, body and soul. In my view, research on mindful eating should emphasize these implicit changes as they point to the huge opportunity mindful approaches offer: Often it is not our behavior, but our attitude (as well as related feelings, cognitions, etc.) towards our eating, which shapes our emotional world. A shift in attitude might let us experience more space. For me, this is also one responsibility of research: To shape the view on looking at new approaches like mindful eating by carefully defining the researched outcomes. Doing a PhD is not always easy, but for me our community helped a lot in remembering what we are all aiming for: Letting others feel our passion about mindful eating, so they may get to know the concept on their own, experience all the joy which is connected to it. What ways are you going to share your passion on mindful eating? What are the reactions and how much do they support you in your own practice or teaching? I am also carrying out my PhD on ME-CL, here in the UK. Have you published any of your PhD results? Please can you share any references from your publications, so that I can refer to your work in my own research? how wonderful, that you do your PhD on ME-CL! I would love to exchange experiences, so maybe you write me to dpeitz@uni-potsdam.de? I am about to hand in my first international paper. Some results I mentioned here will be in this paper. I will let you know when it is under review, so you can refer to it. Mindful Eating provides a lifetime of interesting discoveries!